Shedding is a natural process in healthy pythons. The frequency at which ball pythons shed depends on the snake’s individual metabolism and how fast it is growing. Young ball pythons shed approximately every three to four weeks, and adult ball pythons shed about every four to six weeks. 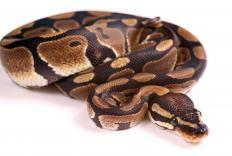 Sometimes other events, like infection or trauma, can cause ball pythons to shed more frequently. If a snake is not growing or is not eating well, it may shed as infrequently as two to three times per year. Shedding is a natural process in a healthy ball python. Snake skin does not grow with the body as it does in other animals. Instead, snakes and other reptiles go through a process called ecdysis, where the old skin is shed as the animal grows to reveal fresh, new skin underneath. The most common reason that ball pythons shed is in response to rapid growth. A newborn python will have its first shedding of skin within a week or so after birth. As each shedding lasts seven to 14 days and the snake may shed as often as every three weeks, a young ball python may seem to be continuously shedding. As a young python grows into adulthood, its shedding may gradually slow. On average, an adult may still shed every 45 to 60 days. Other reasons that ball pythons shed include response to trauma, dirty conditions, or injury. Overhandling can cause stress and lead to more frequent shedding. On the contrary, a snake that does not feed well may not shed as frequently as a healthier snake because it may stop growing. A ball python snake should always shed its skin in one piece, starting at the head. This process can be likened to a sock slipped over the arm up to the elbow and peeled off so that the sock is inside out once removed. The first signs of an impending shed are foggy, blue-ish eyes, dull coloration of the skin, and a pinkish tinge on the belly. Within five to six days, the eyes will clear and the ball python will seek a rough surface to rub against. The entire shedding process will take about a week or two. Shedding problems can develop in response to humidity levels less than 50 percent. Optimal humidity levels for the shedding period are 60 to 70 percent. The presence of mites or bacterial infection can also interfere with the shedding process. Providing a covered bowl with a lid and a hole cut out allows the snake to soak and can help hasten the shedding process. While shedding, ball pythons may be skittish or aggressive and should be disturbed as little as possible. Ball pythons cannot see very well when the spectacle area is shedding and may feel vulnerable. They should not be fed or handled until the shedding is complete. What Are the Best Tips for Feeding a Ball Python? @Animandel - I don't go into my attic often, so when I went up there one day, turned on the light and saw a snake skin in the middle of the floor I couldn't believe it. At first I tried to convince myself that the skin was something else. Then I tried to figure out ways it could have gotten there without the snake actually being in my attic. the flimsy piece of skin in my attic. I showed the skin to different people and most of them thought it was probably a black snake of some kind. If I had wanted to definitely identify the skin and the snake, I could have taken it to an expert. Each kind of snake has specific patterns on the skin and experts can identify the snake by those patterns. So yes, experts can identify snakes by their discarded skins. This article warns about handling the ball python when it is shedding because the snake may be more aggressive at that time. I do not need to be warned not to handle any snake, whether he is shedding or not. However, that does sound like a good piece of information to have. I see snake skins from time to time when I am walking. I would like to know what types of snakes left them behind. Is it possible to tell what kind of snake left a skin?